Let's go to a Beer Garden ! 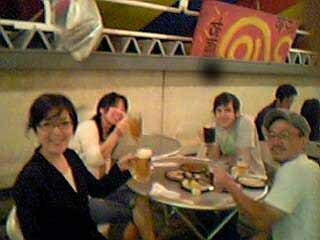 1 week ago,I went to a "Beer Garden" in a building in front of Matsumoto-station,with English classmates & teacher. My teacher ,Baby Jesus had never been to Japanese style Beer Garden. About 2 weeks ago,he suggested going to a Beer Garden. And then,we said "Oh! Let's go Syoki-barai!" That's why,we decided to go and have drink togher. 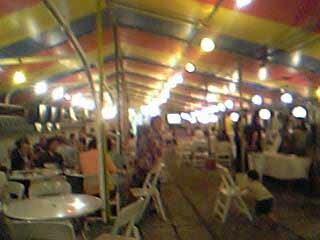 At the entrance of Beer Garden ,I was talked by manager of this restaurant,"Oh! I know you.we used to meet before,didn't we?!" I also knew his face,but, for the life of me, I couldn't remember where we had met. I had no choice but to smile for him and said ”Hi" to him. My teacher,Baby Jesus taught me this phrase,"I can't place him ". That means "I can't place his memory in my mind". The Beer Garden was congested with plenty of drunk people! It was very classical style Beer Garden with a lot of "Cho-chin". And It had "Buffet style",we could drink beer and eat foods as we like. The picture hanging on the wall above us was so funny because of strange letters on it. Those letters were seemed to be Korean and Thai at first grance ,but if you look carefully,you will find out them to be fake?! After we left there,we had 2nd bar and more. After all,we had been drinking till 3am. What fantastic night it was ! Why don't we go again?! Lastly,I regreted that I had coupons which gives ?500 discount each person in the restaurant,but I noticed next day. The survey of " Your Marriage"
This is the survey that was given by Mr.Hinata. I guess my answers were quite prejudiced. Please don't look down on me! I didn't think so in my 20's. My relatives often asked me "When are you going to get marry? ",which bothered me every time I came back to my hometown. And I used to answer them"I will get marry in 21st century." But I began to think that I want to be a wife of someone just before my 30's. Because,Most of my business client were married women,and I began to feel that I was in an awkward position. In those days,I saw my husband. It will have been 10 years in next year since we got married. I feel very happy when I look back this 10 years. I think that it doesn't matter how old I am,and it must be happy if I meet a person who I eager to marry in my 60's or 70's. But, maybe I can not ? Keeping tight mental relationship with me. Sharing same goal in our life. If he told me "I love her seriously. ",I could divorce him as soon as I could. But,I would make him compensate for me as much as he could. He should restart with nothing. I quite agree with Hinata! I usually think that I want to make him happy! 【Ｑ７．Do you give up your job when you get marry? I 've never thought that I should give up my job if I get marry. I couldn't do so if we had a child,but I don't want to give up my job to keep my balance. If we had gone,we must've had quarrels. I basically like to travel alone. I want them to take whatever they can put their heart and soul into. Oh, Who should I ask? I am looking forward to read your survey! Happy birthday to dear Mrs.Chocola! Mrs.Chocola,who has a bright smiling face. I am deeply gratful for becoming your friend and having been getting along with you. I hope that you keep being powerful,attractive lady! I wish your hopeful year.